Soapstone is a soft, pliable stone used for a variety of carving and decorating purposes. The history of working with soapstone dates back more than three millennia. Artisans began working with soapstone in Asia and spread the craft to Europe. In the Western Hemisphere, soapstone carving began with the Inuit tribes of Alaska and northern Canada. Today, many artists still work in the soapstone medium. According to the Kellers Trading Company, soapstone provides sculptors with a variety of colors to choose from. Available colors of soapstone include white, green, gray, brown, black, pink and yellow. Soapstone may be carved using a chisel, though some modern sculptors choose to use power tools. Finished products feature an oily texture, which probably contributed to the rock being named “soapstone.” According to Green Mountain Soapstone, the material is burn and stain resistant, making it an ideal alternative to marble and granite in home décor projects. Soapstone rates a one on the material hardness scale, making it one of the softest carving stones available. The oldest identifiable soapstone sculptures date back more than 3,000 years, according to the Great Art website. The oldest identified soapstone crafts where made by artisans in China. Experts believe that artwork made of soapstone has survived throughout the centuries because humidity does not cause the stones to break down. The Ming Dynasty, which lasted from 1368 to 1644, saw the height of soapstone production in China. 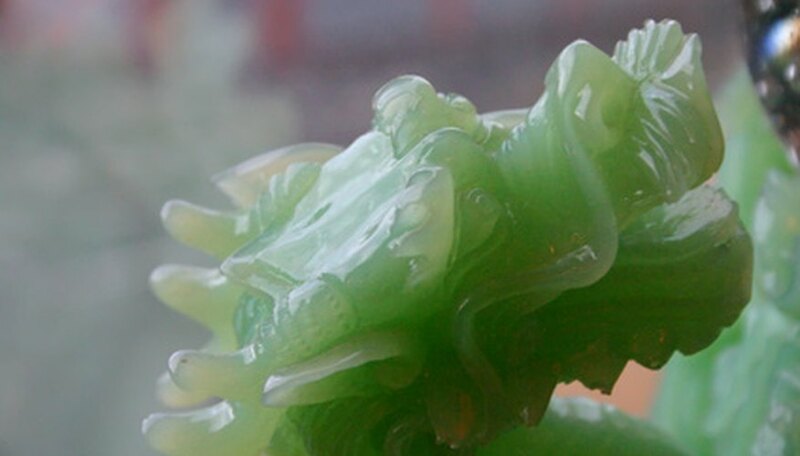 Soapstone became the standard as jade prices rose, making it too expensive for many artists. From its beginnings in China, the art of working with soapstone spread throughout the world. The Cretan people of ancient Greece used soapstone to make stamps and receptacles. The Vikings employed soapstone carving skills in much of their jewelry. In Africa, sculptors in Zimbabwe produced many soapstone sculptures. The height of Zimbabwe’s soapstone production was between the 11th and 16th centuries. Soapstone carvings were also a popular art form in Iran. By the 17th century, the mainland Europeans had begun to create soapstone works of art. Artisans began using it in crafts and it reached its height of popularity during the Art Deco period between the 1920s and 1940s, according to Great Art. Art was not the only historical purpose for mining soapstone. In Ancient China, artisans used the stone to create dishes, cooking utensils and vases. In Europe, people still make traditional Scandinavian cooking pots using soapstone. According to the Green Mountain Soapstone website, colonial settlers of New England used soapstone on their fireplace hearths, to make sinks and to make countertops. Modern artists, including members of Inuit tribes, still use soapstone to produce beautiful sculptures. In addition to art, soapstone serves as an alternative to marble or granite. It can be part of kitchen and bathroom design on sinks, counters and ovens. It also serves as a liner for fireplaces and masonry heaters, according to Green Mountain Soapstone.